Kallyani's go the last mile, riding their bicycle to bring essential products and services to people's doorsteps. iSocial is the revamped identity, which is short for ‘Infolady Social Enterprise Limited’. Formerly known as Infolady, and ‘Kallyani’ at present, it’s a model for empowering communities through women entrepreneurship. We emerge as ‘iSocial’, from our former identity of Infolady Social Enterprise Limited and also, Infolady will be known as ‘Kallyani’. This entrepreneurship model is a dynamic one, which has won several prizes over the last few years and made a visible impact by bringing socio-economic changes on the lives of the people of the rural community. As technology is constantly upgrading and updating its own stream, everything surrounding it and based on it also need to change to cope up with the need of time. We have also identified this and updated our award winning model to serve the society in a better and well-suited way. Through partnership and support from the ICT Division of Bangladesh Government, our plan is to expand first to 16 districts deploying 1,000 Kallyani’s and then gradually throughout the whole nation to deploy 10,000 Kallyani’s by the end of 2021. It’s a bold step towards fulfilling the vision of Digital Bangladesh. On the 17th September, 2016, through an event held at the DC Office, Natore, our new identity was inaugurated by Chief Guest Mr. Zunaid Ahmed Palak, State Minister for ICT Division, Bangladesh Government. One of the most successful programs that Dnet has developed and launched is the ‘Infolady’ model. Initially known as ‘Mobile Lady’, this is a model for empowering communities through women Info-preneurship. Challenging the status quo and creating the voice – was the essence behind coining the concept of ‘Infolady’. This model was developed by Dnet in 2004. This innovation has a direct contribution to SDG-3 (Sustainable Development Goal, Good Health and Well-being), SDG-5 (Gender Equality), and SDG-8 (Decent Work and Economic Growth). It is a ‘women-for-women’ family based info-preneurship model, where a young woman entrepreneur equipped with modern ICT devices (i.e. Tablet, Smartphone, Dongle, Laptop), travels around villages on her bicycle, and facilitates well-being of the marginalized lives through creation of informed choice options. She establishes fee-for-services operations- ‘service with information’, or ‘service and product with information’ and earns between USD 60 to USD 260 per month, depending on her skills and daily time allotment. Round the clock internet connectivity allows her to update daily transaction data through an integrated system. Being able to be connected with a regionally established Hub enables her to get regular mentoring and supply chain support services for business enhancement. Infolady model is a modern business initiative to facilitate the backward and forward linkage between end user and point of regional facility disbursement. This model created 100+ women entrepreneurs in Bangladesh in four different pilot phases. Infoladies are noticeably empowered (6.9 in a scale of 10), and well accepted (6.4 in a scale of 10) in family and society. Infolady model served door-steps over 450,000 rural citizens in the last five years (2011-2015), where the total time savings by citizens was equivalent to 331,667 work hours. On average 36.9 minutes time is saved by the citizens over each unit of service they received from Infolady than the other sources. Besides, citizens also saved livelihood cost, increased income and claimed their rights. The entire benefit received by the citizens in financial terms was 3.21 times higher than the investment made in five years to establish and operate Infolady Model, i.e. for USD 1 investment, citizens received benefit valued USD 3.21. Since 2004, the Infolady model has gone through multiple stages of experimentation, as it required significant social engineering. In order to establish this innovation, Dnet efficiently utilized grants received from Global Knowledge Partnership, Research Initiatives Bangladesh, Manusher Jonno Foundation and Global Development Network. Dnet acknowledges support from Bangladesh Bank and National Bank for the ‘Infolady’ SME loan scheme. Now, it is an established innovation to scale-up in Bangladesh and replicate globally. Dnet has already formed Infolady Social Enterprise Limited is a separate enterprise to scale-up around 10,000 Infoladies in Bangladesh. Likewise, Dnet extends expertise to different institutions for replication of Infolady model globally. Setting footprints across the borders, Infolady is underway inauguration in Haiti in the year 2016. Operations at Haiti is a replication and scale up of this program at an international country. published in different forms of media. The successful journey of this program continues as it’s still going strong and growing step by step as all the involved people are working hard to keep it that way, and the coordination and cooperation from the supporting organizations helps a lot in the long run. The smile in the faces of the rural people, the beneficiaries and the infoladies is the biggest achievement and we are committed to keep it constant. 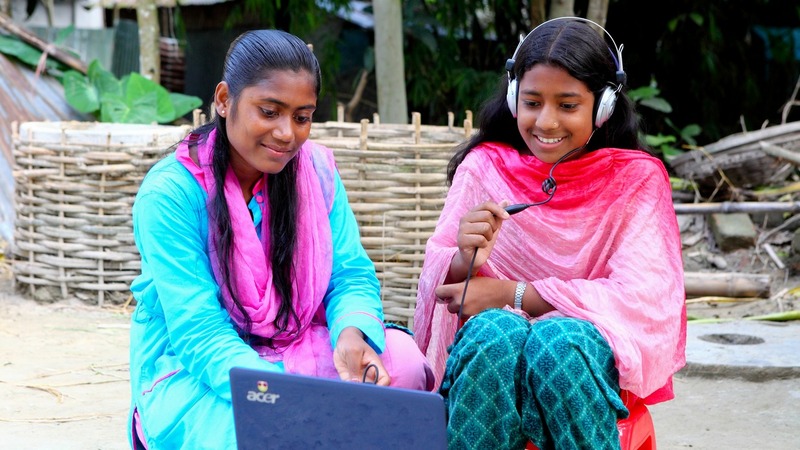 An Infolady is showing a learning video to an adolescent girl. 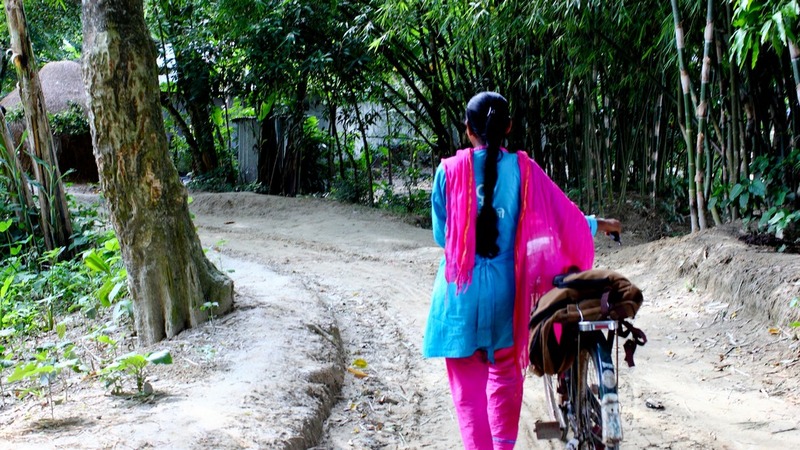 An Infolady walking her cycle through the countryside roads to provide services to people's doorsteps. Kallyanis (former Infolady) equipped with new uniforms and bicycles, determined to continue their journey to serve people and bring a smile to their faces.